Copying & Duplicating Services. Find a location or print online. Fedex Office has locations all over the world offering In-Store Services such as copy/printing, personalized products, signs and graphics, photo services, business documents, packing/shipping services and technology services. 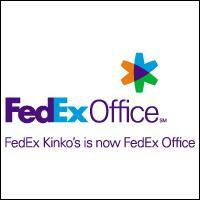 Online services allow customers to print to a Fedex Office, photo services, direct mail services, and office products. Business solutions such as document services, signs and graphics, direct mail services are offered, as well as Fedex Kinko's DocStore offers digital print-on-demand creating an online customizable catalog. No reviews were found for Fedex Office Print & Ship Ctr.